Saturday is the day, our exhibition Reflecting the Real opens at 11am. Featured are works by 19 very talented artists who are all associated with the Grand Central Atelier. Included are some major works by Todd Casey, Ken Salaz, Erik Koeppel, Carol Broman, Camie Salaz and Justin Wood. In addition, there is a very special work by Anthony Mastromatteo which will be an interactive piece. Along with his important work, Where Art Often Starts, we will be showing his Vending Machine. Yes, this is an actual vending machine where you can buy a turn of the knob and out comes a random 1 x 1 inch work of art. In addition, there will be 4 blank pieces. If you are lucky enough to get one of the 3 white canvases, you can choose the image you want. If you get the 1 gold canvas, you will be able to choose the image and also receive a 12 x 12 inch version of the work … a $1650 value. There are only 44 capsules in the machine, so come early and take a chance. For those of you who are not able to attend the exhibit, but would like to try your luck, please call the gallery and we will turn the knob for you (we will even video the action and send it to you). Each turn costs $150 (plus NYS sales tax, for those who live in NY State). We are pleased to send on the following updates for a few of the artists we represent. Todd Casey’s Birth of a Kamikaze which was featured in the recent Allied Artists of America’s 102nd Annual Exhibition at the Salmagundi Club, New York, was awarded the Gold Medal … does not get any better than that! Julie Bell will be participating in a number of upcoming exhibits and events. Two of her works were selected to be included in the Art Renewal Center’s exhibition at the MEAM in Barcelona (opening November 20th) and the Salmagundi Club in New York City (opening January 18th). She will also be showing several original paintings at The Allentown Art Museum during Illuxcon (IX 2015) which runs from October 21-25th; Julie will be attending the show daily so if you are in the area, stop by and say “Hi!” If you are lucky, you may catch her doing a live painting demonstration! Jay Davenport won the Animal Award of Excellence from the Oil Painters of America. His work, Keep Your Eye on the Ball will be featured in the Oil Painters of America National Exhibit. Rodney O’Dell Davis was selected to participate in the Art Renewal Center’s upcoming exhibition at the MEAM in Barcelona (Nov 17th – Jan 10th) and the Salmagundi Club in New York City (Jan 18th – Feb 4th). Stuart Dunkel was selected to participate at the Guild of Boston Artists. Erik Koeppel has works being exhibited at the Museum of White Mountain Art’s Personal Favorites exhibit in Jackson, NH. In this exhibit, 23 collectors of 19th century White Mountain Art were asked to select their favorite work from their personal collection. Further, Erik was invited as one of four contemporary artists to display their own “personal favorite.” Erik and his studio were also featured on a show called Chronicle which aired on ABC 5 Boston this summer. You can see the clip HERE . Finally, Erik will be lecturing this Sunday, October 4th,at the Fruitlands Museum doing an Artist Talk in conjunction with their new Hidden Hudson exhibition in Harvard, MA (more info HERE). Noah Layne’s Dragon Fruit will be featured in the Art Renewal Center’s Salon Show at the MEAM in Barcelona and Salmagundi Club in New York City. Additionally, his work Flight of Hope (which we sold this past year) is a finalist in the Artist’s Magazine’s annual Art Competition (Dec. Issue). Carlos Madrid will be participating in the Parsons 5th Annual Alumni Exhibition from October 10th-17th at the Sheila C. Johnson Design Center at Parsons School of Design. Anthony Mastromatteo recently finished installing his trompe l’oeil wallpaper at Elan, a new restaurant in New York City’s Flatiron District. The wallpaper runs 28 feet long, across the length of the bar, and features his trompe l’oeil painting She Soars. It will be in place through the end of March, so if you are in the area stop by for a look… oh, I should also mention the chef and owner, David Waltuck, was the chef and owner of Chanterelle, a staple of the Tribeca food scene for over 40 years! If you stop by you should probably grab a bite to eat too. September was yet another crazy month for the stock market. Amy & I spent some time in Europe and at one of our hotels the only English TV channels we could get were BBC and CNBC … so I was forced to watch the gyrations of the stock market from time to time. I must tell you that I was rolling on the floor with laughter. Each day there was one ‘expert’ telling viewers how the stock market had bottomed out and right next to him/her was another claiming that this was only the beginning of a bigger correction … one ‘expert’ even thought a DOW 5,000 was a possibility. Really! Give me a break. I think we have all learned by now that these experts are little more than Guess-perts. Nobody has a crystal ball and nobody really knows where things will be tomorrow, next week or a year from now. Now yes, if the market takes a big correction, those who were touting it will be hailed as the all knowing, but if it does not, we will never remember their comments and those who told us the bottom had come will be the ‘all-knowing’. In the end, someone is going to be right. As with all other parts of the news, if it does not have shock value, then nobody wants to report it … so sad, but so true. Anyway, September turned out to be a downer. We opened on the 1st at 16,528 and closed that same day at 16,058 (450 point drop – which I figured was not going to be a good sign); however, for the rest of the month we stayed in a trading range of 16,100 – 16,700 and closed out the month at 16,284 … far better than I expected. Anyway, here are this month’s closing numbers for some of my favorite stocks: JP Morgan ($60.97 – down 4.88%), Exxon ($74.35 – down 1.18%), GE ($25.22 – up 1.61% ), AT&T ($32.58 – down 1.87%), Verizon ($43.51 – down 5.43%), Wal-Mart ($64.84 – down 0.17%), Coke ($40.12 – up – 2.03%), DuPont ($48.20 – down 6.41%), Merck ($49.39 – down 8.28%), Disney ($102.20 – up – 0.31%), Citi ($49.61 – down 7.24%), Intel ($30.14 – up – 5.61%) and Bristol-Myers ($59.20 – down 0.45%) --- the downs far outweighed the ups! The Purloined Warhols - Three decades ago, an American film editor purchased ten silk screen prints by renowned American pop artist, Andy Warhol, and hung them in his LA studio. The set, known as the “Jewish Geniuses,” includes portraits of Golda Meir, The Marx Brothers, George Gershwin, Albert Einstein, Franz Kafka, Louis Brandeis, Gertrude Stein, Sarah Bernhardt, Martin Buber and Sigmund Freud. Recently, when a family member noticed the works were sagging they brought them to a framer to be fixed. To their astonishment, they sadly found out that at some point over the past thirty years someone had swapped the originals with replicas – sneaky, sneaky, sneaky. The set of 10 is valued at $350,000 and the LAPD is now on the hunt to find the authentic pieces. Karl Waldmann: Where Are you? A German criminal gang has rocked the art world with their bold, yet unraveling Dada artist forgery scandal. According to reports, Karl Waldmann, a Dresden-born artist made a resurgence when his works were “rediscovered” by a French journalist at a Berlin flea market in 1989. Unlike most forgery scandals we often hear about (which involve fake works of art), the forgery in this case is the alleged artist. Yes, there are no records of his existence…..ever. In fact, there is no reference to him in any art historical documents and his biographical material is next to nothing. It appears that the ring of criminals fabricated the artist and fooled auction houses, galleries and even museums by selling and exhibiting Waldmann’s works as pieces by an authentic Dada artist. However, Pascal Polar, a gallerist who sells Waldmann’s work, insists that Waldmann did/does exist. Interestingly, “The Karl Waldmann Museum”, which has no physical address, states they have a large authentication committee -- which Polar just happens to be part of. This is a real interesting one! The Purloined Goyas - The painting Dream of St. Joseph and a drawing “Sketches of Heads” attributed to Spanish romantic painter, Francisco de Goya, were recently stolen from a home in Madrid. It is believed that the burglars originally targeted the home in hopes of making off with money and jewelry. However, once they opened a safe inside they found both Goya works which are valued at $5.6 million. Spanish authorities are working to recover the artworks. Well we are gearing up for a very busy fall season, sales and shows are going to be non-stop! To kick off the season, there were a few interesting results in the collectables and art markets. You may have heard about an unsigned painting at a recent sale that really blew away the estimates. It was a portrait of three figures, believed to be a 19th century copy of an Old Master painting, but if the result is any indication, it may very well be an early 17th century painting by Rembrandt. The piece was estimated at $250-800, and when the bidding started, that estimated was left in the dust; the work hammered down at an astounding $870,000!!! REALLY! ($1.2M with the buyer’s commission) After the sale, the under bidder stated that he thought that the painting might be by a teenage Rembrandt, c. 1625…guess someone else thought so too. It was bought by someone on the telephone from Europe; it will be interesting to see what the experts have to say about this one. Another surprising result was a Chinese Qing dynasty silk-embroidered thangka that breezed past its estimate of $80-120K and sold for $1.5M!! The thangka, produced during the 18th century and measuring 36 ½ x 26 ½ inches, depicts the principal deities of the Highest Yoga Tantra, Chakrasamvara and his consort Vajravarahi, joined in jubilant union. The delicate, precise and meticulously handcrafted thangka is an exemplary example of the artistry associated with the Qing Imperial court and the textile workshops in Suzhou, Eastern China. A rare Celadon-glazed vase with a Yongzheng seal mark (c.1722-1735) proved to be one of the stars at a recent auction when it garnered $706K against its $150-200K estimate. The hexagon shaped vase is an excellent example of the technical greatness achieved by craftsmen working with the imperial kilns in Jingdezhen; as demanded by the Yongzheng emperor, each piece must be of the highest level of artistry and the slightest irregularity would result in the piece being rejected and destroyed. Now that is real quality control! Now this little beauty attracted a lot of interest from the trade shortly after the catalog was released and the auctioneer stated that he thought it might bring as much as $1500 after receiving many emails and phone inquiries…although the original estimate was only $157-315. An 18th century porcelain miniature Bow cup, just 1 ½ inches high, thought to have been a child’s toy which might have been produced by the likes of Worcester, Caughley and Lowestoft, was the prize. Two dealers battled it out on the phone and the cup soared past its estimate and sold for $10,200 (plus the buyer’s commission). Ok, not quite near a million dollars, but for a little cup, that is really impressive! The month of September was a rather quiet one for much of the art world. Amy & I were invited to a wedding in Florence and decided to take a few extra days and refresh the ‘art history’ parts of our brains … the trip, which included Venice, Florence, Rome and Paris was filled with outings to many of the great art museums – these included the Uffizi & Vatican – along with many of the great monuments painted by the artists we all know and love – the Colosseum, Pantheon (both in Italy and Paris), Santa Maria della Salute, Piazza San Marco, Arc de Triomphe and the list goes on. In addition, we were able to see some of the great works of art from the Old Master to Modern Masters – Michelangelo, Caravaggio, Raphael, Leonardo, Fra Angelica, Masaccio, etc. I felt like I was back in my NYU art history classes. 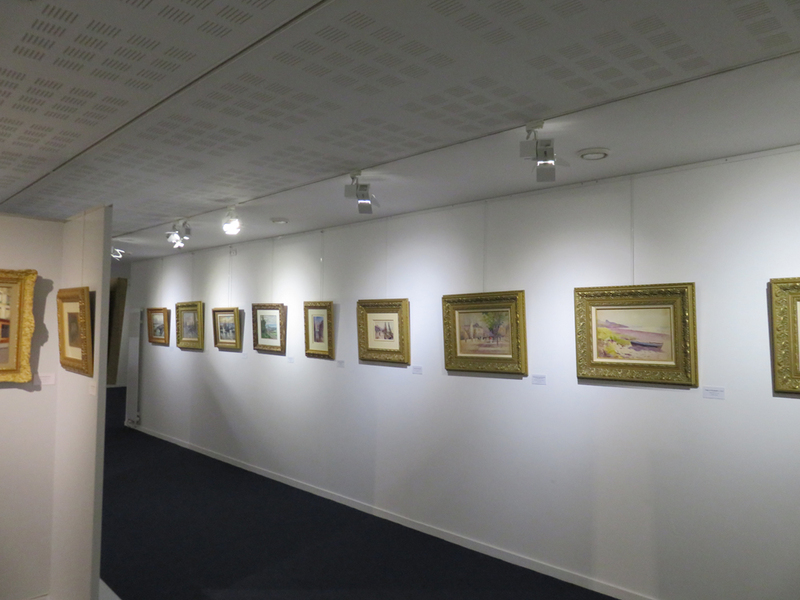 It was great to, once again, see many of these works in the flesh – the photos just do not do them justice. While in Italy we learned that there are a lot of contemporary artists who follow us on the web and upon our arrivals in Florence and Rome we received a number of invites for studio visits. We took each artist up on those invites and had a great time. In addition, during our stay in Venice we attended the Biennale – which for a 19th century European painting art dealer was very interesting … not sure how some of the items we saw can be classified as art; but then again, these days most things can be considered art if an ‘artist’ says it is art. Who am I to argue? One of the more ‘fun’ things we did was to search for the locations many of our artists chose for their works. You can see some of the Then & Now images on our blog posts … and there are more to come. 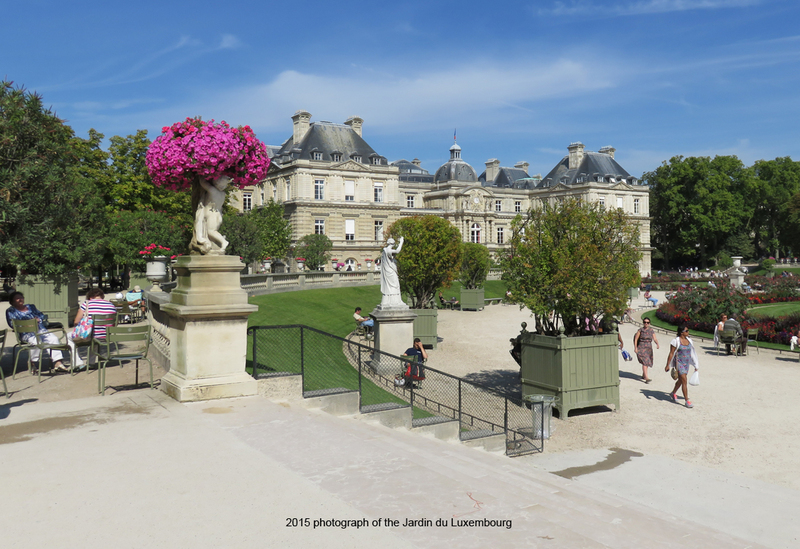 The best of them was Cortes’ view of the Jardin du Luxembourg and a photo I took from the same vantage point … in case you missed it, here they are again. The next two days were filled with seeing the great monuments that were portrayed by Cortes, Blanchard, Laloue and many others; along with visits to Martin Dieterle’s studio (the Corot expert), lunch with Nicole Verdier (the author of the Cortes Catalogue Raisonné) and a great dinner with a distant relative of Julien Dupré (who is assisting us with our research). 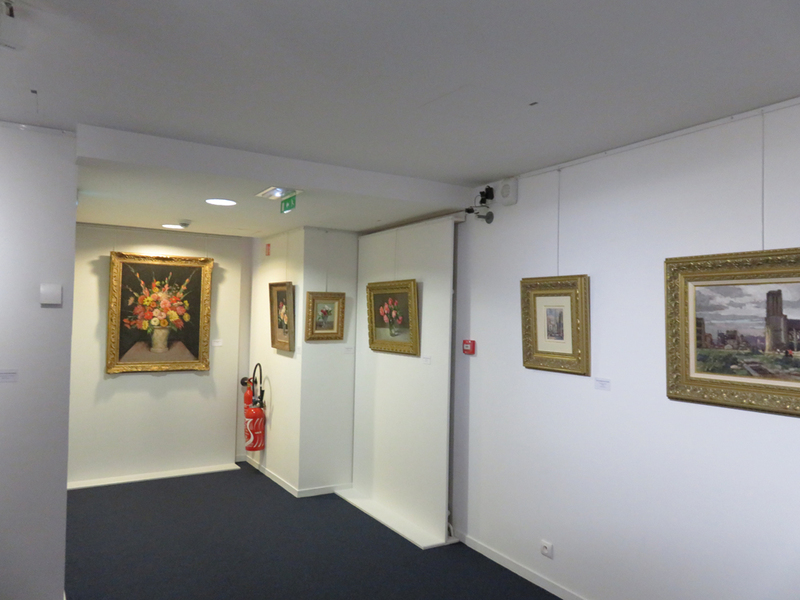 Oh, and while I am on that topic, Janet Whitmore arrived in Paris the day we left to start her research … her updates have been very promising. If you have the opportunity, and are a fan of great academic works of art, I would definitely recommend a visit to Italy. Now let’s get back to the daily grind. For us, the month of September was actually a crazy one … mainly because we had a lot to do and not much time to get it done – we took a lot of time off and the Pope’s visit and UN session forced us to close for more days than we planned. Our real action starts this Saturday … with our Reflecting the Real exhibition (discussed earlier) and then the months of November and December will find us at shows in Winnetka, New York City and Palm Beach – these 3 shows will take place over the span of 5 weeks. From November 5 – 8 we are in Winnetka, then we are at the 67th Street Armory (NYC) from November 20 – 24 and the following week we head to Florida for the Palm Beach Show – December 3 – 7. Keep your eyes peeled for links to complimentary tickets. Well, enough about our travels. Word has it that the public action will start in October and by November there will be hundreds of millions of dollars’ worth of art hitting the market in New York. Recently it was announced that the A. Alfred Taubman collection will be offered and is expected to bring in excess of $500 million (at least Sotheby’s has guaranteed the family that amount); we are still waiting for the competition to announce some of their BIG lots. This should be a very interesting series of sales and all eyes will be watching. We will keep you posted on all the action through our Blog, Facebook & Twitter posts along with more detailed reports in our monthly newsletter. Gallery Updates: Sadly, the summer is over and we are back to a 5 day work week … really hope June shows up quickly!! 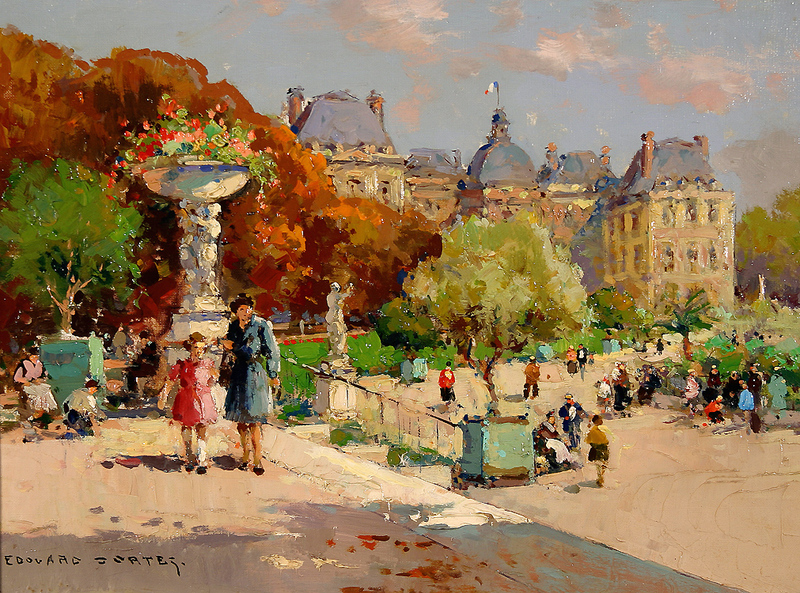 Web Site Updates: We have added a number of new works by the following artists to our web site: Gen Paul, Edith Corbet, Edouard Cortes, Noah Layne, James Hollingsworth, David Palumbo, Todd Casey and Mark Daly. Next Month: Early auction action.